Hello! I'm Speaking Notepad! I am powerful and handy analog of Microsoft Notepad. I'll read your TXT, DOC, PDF, HTML and RTF documents aloud with SAPI4 and SAPI5-compliant high quality voices, different speed and pitches, read clipboard content, record texts into WAV, MP3 or WMA files and even read every word or sentence you are typing. Read e-books and create audio books in one click with my help. I'm sure, we'll become friends! ...... and pitches, read clipboard content, record texts into WAV, MP3 or WMA files and even read every word or sentence you are typing. Speaking Notepad is designed for those who value swift commodity in work combined with fascinating abilities and an interface which will delight your eyes. * Make a present to your eyes - Your eyes are getting tired during long and intensive work. When you are staring at your monitor your eye muscles strains a lot. Such work at the breaking point of your eye capabilities may cause serious problems with your eyesight in the nearest future. Give a rest to your eyes with Speaking Notepad! * Type text without looking at the screen - You are typing long text and constantly turning your eyes from keyboard to monitor to control what you are typing? Now you can concentrate only on work and your thoughts because Speaking Notepad can read aloud what you are typing. Speaking Eng-Hindi Roman Script Dictionary. Qweas is providing links to Speaking Notepad 5.2 2012 as a courtesy, and makes no representations regarding Speaking Notepad or any other applications or any information related thereto. Any questions, complaints or claims regarding this application Speaking Notepad 5.2 2012 must be directed to the appropriate software vendor. 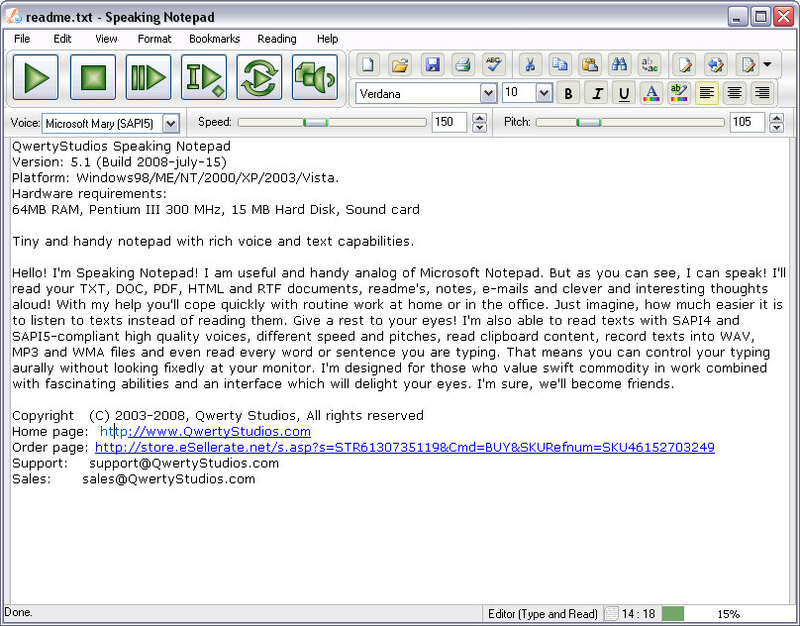 You may click the publisher link of Speaking Notepad on the top of this page to get more details about the vendor.